I would like to share a refined strategy on how to protect your hosta garden from deer. This is an accumulated strategy, built from research and experience. Using deer deterrents successfully can be somewhat of a challenge, but I have applied this strategy within my own hosta gardens with great results. You have to understand and accept a few principles guiding the behavior of the individual deer and the herd. There are many variables that can play a role in the behavior of the deer. These variables include but are by no means limited to weather conditions, herd size, available food, and time of year. The individual deer appears to have a great memory. It will recognize that it is April, and the hosta are emerging from your garden. Or perhaps it is January with heavy snow cover; that same deer remembers that the yews and arborvitae in the garden are still tasty. If the deer is hungry enough, it will eat right at your front door. The fact that the individual deer bears this strong memory is troublesome enough, but the doe brings her offspring into your gardens to feed as well. As a result, the entire herd retains the memory of your location. Even if something happens to the mother doe, her offspring will remember where she took them on any given week. Due to the factors listed above and the deer’s ability to remember feeding locations, it is my opinion that a multi-faceted approach is key to protecting your hosta from them. It is important when combating deer to have a less desirable yard than your neighbors. 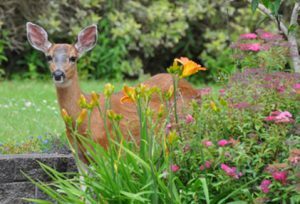 Like the old joke about the two campers who run into a bear on their trip, “I don’t have to outrun the bear—I just have to outrun you!” As long as the deer are more attracted to your neighbor’s yard, you will not have them in your gardens. While I will not explain in detail how to utilize various deterrents due to the wide array of products and tactics available, I will mention some that have worked well for me. It is recommended that you do some research and experimentation in order to find which products or tactics will work best for your situation. A dog that is free to roam your yard and urinate randomly is a great deterrent. If this is an option for you, then it is a great place to start; however, I understand that most homeowners are not in the position to make this work. I am fortunate enough to be able to do this. Abby and the other dogs that have roamed freely during working hours and urinated as they pleased have kept the deer completely out of our gardens despite the heavy population of deer in the area. If a free-roaming dog is not an option, there are still plenty of tactics to implement. Regardless of which ones you decide to use, I suggest that you use three different deterrents at any given time. I also strongly recommend mixing up tactics from year to year. As said before, the deer are smart and carry a great memory. Changing tactics up will keep them from outsmarting your efforts. 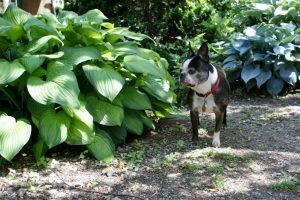 Using the canine urine, the soaps, the motion makers and other approaches in a combined rotation will certainly put up a strong fight against the deer in your hosta gardens.